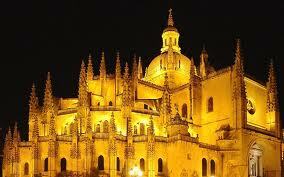 Segovia is the capital of the province of Segovia and is only 30 minutes by train from Madrid. It is located in the region of Castilla-Leon, and was a city of great importance during the Roman and medieval era. Surrounded by a medieval wall, and bordered by two rivers, because of its high elevation it benefits from long, refreshingly cool summer evenings. An enchanting city with winding alleyways and pedestrian streets lined with side walk cafes, you also have wonderful views of the countryside. The Alcazar castle is an impressive fortress within the walls, which was in fact a huge inspiration for Walt Disney. Visited by the Kings of Castilla, this is where Queen Isabella promised Columbus financial support for his voyages to North America. Visitors are welcome to climb the battlement tower for a panoramic view of the Segovian countryside. The Calle Real is the most interesting of the pedestrian streets, which joins the Plaza del Azorguelo to the Plaza Mayor, where most of the significant monuments are located. The original Roman cathedral was destroyed, and then replaced in the 16th century. It now stands in the Plaza Major, and is an excellent example of Renaissance Gothic architecture. The Caballeros neighbourhood lies within the city walls as well. This is where you will find all the wealthy houses and palaces of the great nobles. Beyond the walls of this historic quarter are lovely gardens and squares, which make a wonderful place to relax while you are exploring the city. Segovia is probably most famous for its Roman Aqueduct, which was built in 1AD. Because of its historical importance, it was declared a World Heritage Site, as it is the best preserved and largest of its kind in the world. At its highest point it measures 28 metres high, 800 metres across, and is the main entrance to the historic quarter. The aqueduct used to carry water to the elevated city from 15 km away and, between 1455 and 1864, it featured on their coins. The city’s Mint was built in 1583, and is actually the oldest industrial manufacturing plant in the world still standing. There are several convents in Segovia. The Covento de San Antonio El Real, which until recently was closed to the public, was the summer residence of Enrique IV, and later given to the nuns. Now it is a national monument. The Convent de los Padres Carmelitas is where the remains of the poet San Juan de la Cruz rest. Another place to visit is Corpus Christi, which is an old Jewish Synagogue from the medieval times. On the outskirts of town is the Roman church, Iglesia de la Vera Cruz, where it is said a piece of Christ’s cross was received. For art lovers there is the Contemporary Art Museum (Museo de arte contemporaneo de Segovia), which is located in one of Enrique IV’s palaces, and has a permanent collection by Esteban Vicente. There are also several festivals throughout the year, with the Easter processions being the most famous throughout Spain. Segovia also hosts an International Puppet Theatre Festival in May. 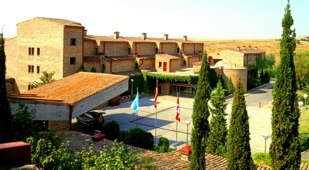 Three kilometres from the centre is the city’s own Parador, a luxury four star hotel which is situated on the El Terminillo estate. The location was chosen because of its wonderful panoramic views of the city. The Parador is modern, very welcoming, and has both an outside pool with views and a heated indoor pool. If you care to explore Segovia’s surrounding villages, you will not be disappointed as they are delightful, such as Ayllon, Pedraza, Coca, and La Granja de San Ildefonso. The National Park Las Hoces de Duraton is another place of interest, with almost 130 different varieties of birds, including one of the largest colonies of vultures nesting in the canyon rocks. There are also cave paintings that date back to the Bronze Age, and old Roman bridges and chapels. Being so close to Madrid by train, you could easily combine both these great cities if you are staying for a while. What an interesting combination it would make to be able to enjoy this extraordinary walled city, as well as Madrid, which is only half an hour away.